There are quite a few popular Lebanese dishes that have a reputation of being very difficult to make, which is probably why many people wait to go to their mom’s house to eat them. Moghrabieh is one of them. 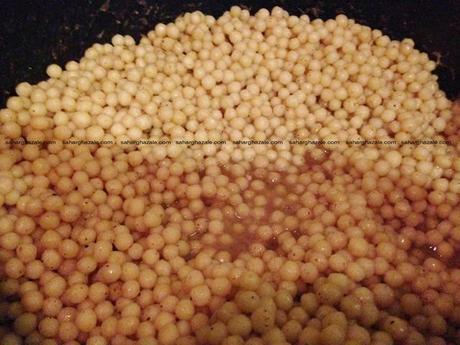 Moghrabieh looks like a grain or an oversized couscous but has more of a pasta texture made of Semolina and is formed into small balls, you can buy a dried version (shown above) or a frozen version and wait for it to thaw. this is the carb part of the dish, the main flavors include Caraway, a spice which has a distinct and refreshing flavor, also used as base for a popular dessert called Mighli. 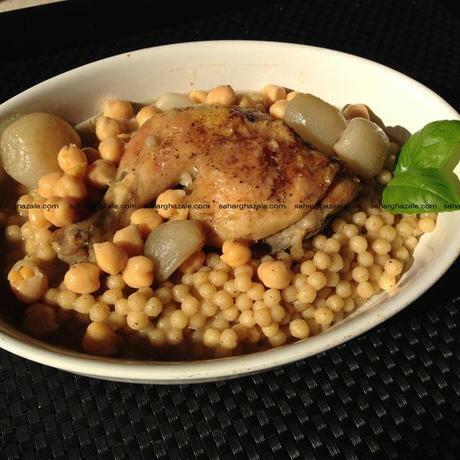 The other ingredients in my version of the Moghrabieh, include: chicken, preferably thighs, baby onions or shallots, chickpeas (already soaked or canned would be perfect), chicken stock (I make it from the thighs with additional herbs, onion, & garlic). I will walk you through the recipe below and list the ingredients at the end, this way you will be more familiar with the process. 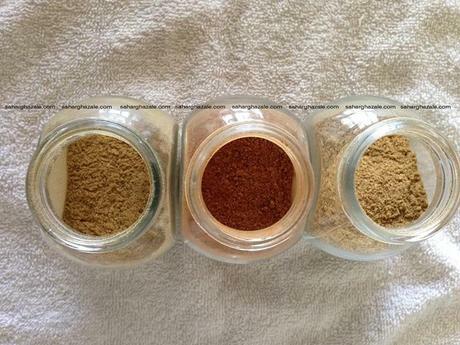 The spices used mainly are: Caraway, cinnamon, & coriander. I love spice photos they look nice. The first step, boil the chicken thighs in hot water, adding minced garlic, cardamom,cinnamon stick, bay leaves, cloves, & a big onion all for flavor and health benefits. ( shown in the first photo) I really do believe a good stock will affect the taste of a meal greatly. Remove any froth that may float on top. once done reserve the liquid and strain it to get an almost clear broth. Below is what it should look like. During this time, put some paprika, salt, & pepper on the chicken, spray with some oil and into the oven to get some color and a nice brownish crust, remember it doesn’t need too long as the chicken is already cooked from boiling. 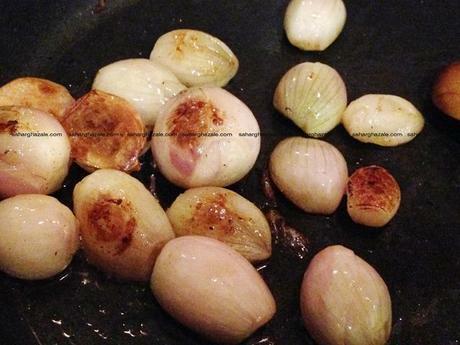 In a separate pan (a bit deep) fry the small onions/shallots in some oil Canola – preferable, you can add some butter as well for some shine. I didn’t. 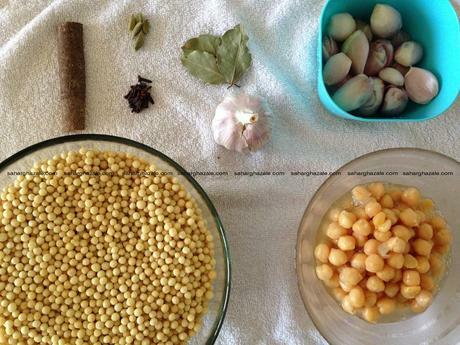 Then add the chick peas with the onions, and then the broth. This will make the sauce. it is crucial to add a good amount of Caraway, cinnamon, salt, & pepper. 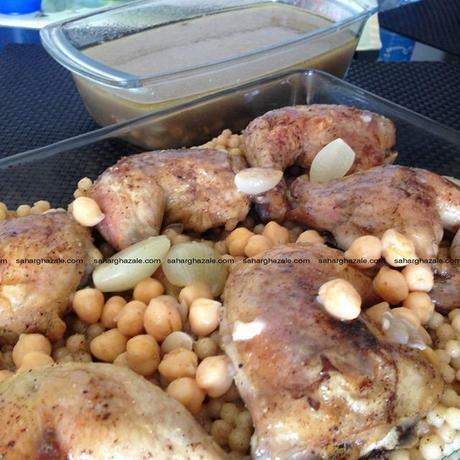 in a third pot, put the Moghrabieh, with enough chicken broth, add also Caraway, cinnamon, & salt. 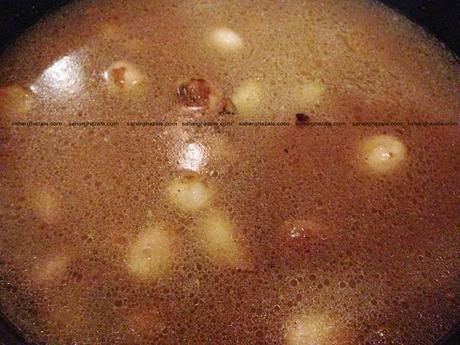 Cover the pot and allow the Moghrabieh to become tender, if the pot dries out, add more broth or water if you are out. 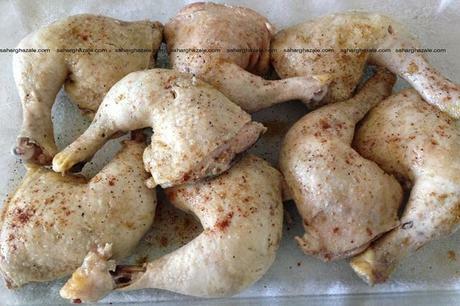 Check on the chicken in the oven, remove if they are golden brown. When the moghrabieh is tender, remove from put and put into a large serving dish. lay the chicken pieces on top and some of the chickpea/onion sauce. leave a large amount of the sauce on the side as the moghrabieh tends to absorb all liquid. 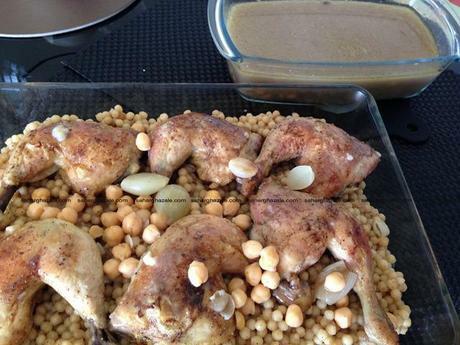 In each plate serve the moghrabieh, chicken, and add the sauce. This is probably one of the easiest methods and full of flavor. I don’t add meat chunks like other people, I like to keep it simple, and light. 1 bag Moghrabieh (around 1 KG). frozen and thawed or dry. 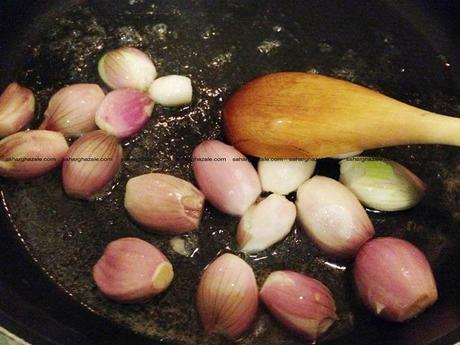 1- Boil the chicken in a pot full of water with the onion, minced garlic, cinnamon stick, cardamom seeds, cloves. remove froth when it floats. 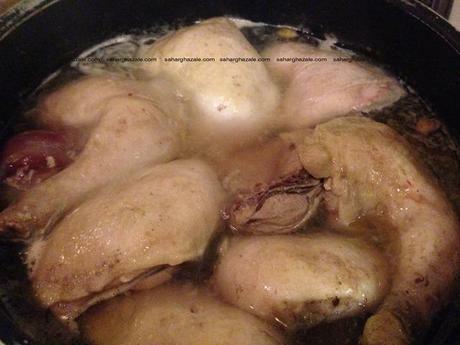 boil until chicken is thoroughly cooked. 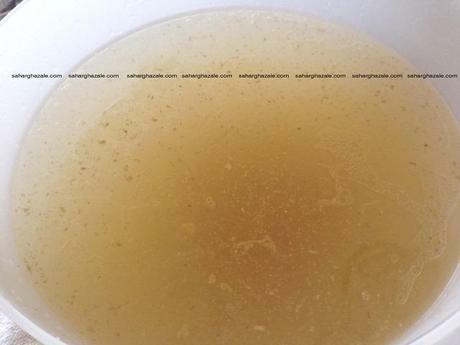 remove chicken and strain the broth to get an almost clear liquid. put the chicken in a Pyrex dish, put some spices such as paprika, salt & pepper, spray with oil and into the oven for some color. 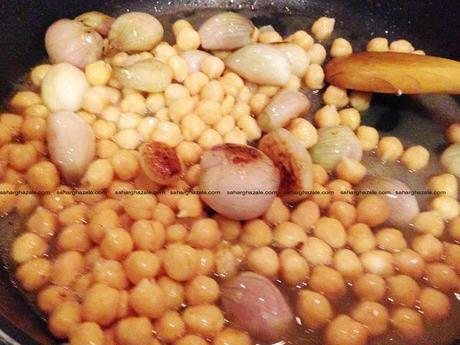 2- In a separate deep pan, fry the small onions until golden brown, add the chickpeas than around 2-3 cups of the broth. Add 2tsp Caraway, 1 tsp. coriander, 1 tsp. cinnamon, 2 tsp. salt, and some pepper. leave on low heat, add flour to thicken. for better results, put the flour in a separate cup with some cold water, mix then add to the sauce to not get any clumps. 3- In a third deep pot add the Moghrabieh with 5-6 cups of broth, add water if not enough left. add 1 TBS Caraway or more, coriander, cinnamon, some salt, cover and keep on low heat till Moghrabieh is tender. you can try one to make sure it’s tender enough. 4- Check on the chicken, remove when golden brown. 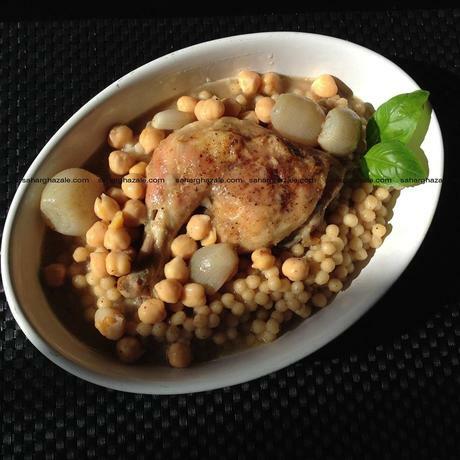 5- Once Moghrabieh is cooked, put on a serving dish, lay the chicken thighs on top, put some of the onion/chickpea sauce. 6- Place sauce in separate bowl.